The French National library (BnF) presents a major online exhibition issued from a real exhibition which occurs from October 2004 to January 2005 at the BnF on the subject of the sea, entitled "La Mer, terreur et fascination" together with a pool of documentation and research centers on oceanology from Brest (Brittany, France). The online exhibition presents the sea element through a scientific, artistic and imaginary approach. Exhibition materials include manuscripts, illuminations, engraving, maps, literary and scientific texts, paintings, musical works, audiovisual workstations and films. The time span ranges from the 13th century to present-day materials. The Maps section contains pictures and short historical and cartographical descriptions of European and Arabic mappamundi, T-O maps, portolans, Ptolemy's Cosmographia and the Catalan Atlas. The Island section shows and describes the depiction of islands in several historical documents like Medieval manuscripts, Ortelius' Parergon and the sea atlas of Bellin. ACID TEST, a film produced by NRDC, was made to raise awareness about the largely unknown problem of ocean acidification, which poses a fundamental challenge to life in the seas and the health of the entire planet. Like global warming, ocean acidification stems from the increase of carbon dioxide in the earth’s atmosphere since the start of the Industrial Revolution. Leading scientific experts on the problem, many of whom appear in the film and the outtakes below, believe that it's possible to cut back on global warming pollution, improve the overall health and durability of our oceans, and prevent serious harm to our world, but only if action is taken quickly and decisively. Our oceans feed the world, provide jobs, and generate most of the planet's oxygen. Oceans cover 71 percent of the earth and contain more than 97 percent of the world's water. Our survival literally depends on their health. And yet few people realize that the oceans are suffering from a grave affliction caused by increased carbon pollution. More than one quarter of the carbon dioxide from burning fossil fuels enters our oceans, where it makes the water more acidic. Scientists have just recently discovered that this rising acidity is threatening ocean life as we know it. This documentary give our lawmakers - those with the power to limit carbon dioxide pollution - the opportunity to better understand what is happening to our seas due to our dependence on fossil fuels. It vividly illustrates what is happening to our oceans, and offers solutions to revitalize them. Excess carbon dioxide is making marine waters more acidic, which causes a drop in carbonate, the key component in shells. When carbonate levels fall, it is more difficult for organisms to make their shells, which become thinner and more brittle. Ocean acidity has increased an average of 30 percent since the industrial revolution. If we continue to dump carbon dioxide into our seas, ocean acidification could result in a "global osteoporosis", harming not only commercially important shellfish, such as lobster, crabs, and mussels, but also key species in marine food webs such as corals and plankton. That could send shock-waves up the food chain, threatening fish, birds, and mammals. Rising ocean acidity will also hit our economy hard. In the United States alone, ocean-related tourism, recreation and fishing are responsible for over 2 million jobs. Indeed, the U.S. ocean economy creates two and a half times the economic output as the agricultural sector, contributing more than $230 billion to the nation's GDP annually. We don't have to watch these economic opportunities evaporate in the face of acidification. We can take steps to turn back the tide. 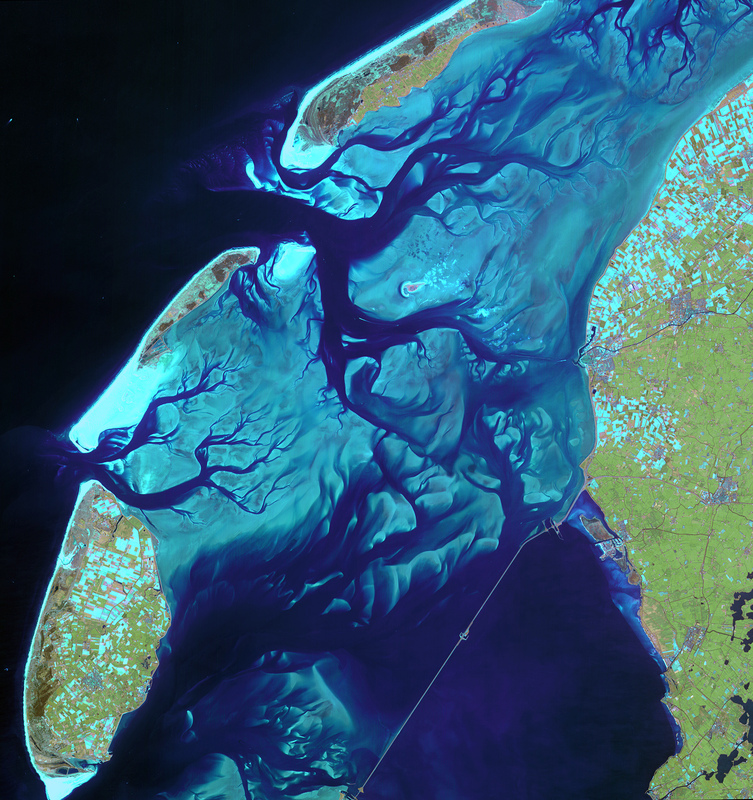 This Spot-4 image captures the dynamic landscape of the Wadden Sea, a tidal wetlands area in the southeastern part of the North Sea that extends some 450 km along the coasts of the Netherlands, Germany and Denmark. The Wadden Sea is a shallow coastal region shaped by the constant flow of low and hide tides that alternate approximately every six hours. The area is characterised by mud flats, salt marshes and low-lying islands. Due to its varied landscape, the area provides habitat for more than 10 000 plant and animal species and an estimated 1,5 million migrating birds. Joining other natural wonders around the world, the Wadden Sea was added to the list of UNESCO World Heritage sites in June 2009. The chain of islands seen stretching from the Netherlands to Denmark is the Frisian Islands, which shield the mud flat areas of the Wadden Sea from the North Sea. Inland from the Dutch Wadden Sea (left of centre), the Texel island is visible and Vlieland and Terschelling to the northwest. This satellite image shows the ever-moving sandbanks in the shallow Wadden Sea, one of the largest wetlands in the world. Aral Sea which lies between Kazakhstan and Uzbekistan, was once amongst the 4 largest lakes in the world. It has now shrunk to 10% of its original size. Global Warming has nothing to do with this disaster. The Aral Sea has been steadily shrinking since 1960's when the Soviets started diverting the rivers which fed into the lake, for irrigation purposes. Two weeks ago, the U.N. Secretary-General Ban Ki-moon said that the drying of the Aral Sea was one of the world's most shocking disasters. One of the consequences of the lake's dwindling size has been the death of the fishing industry on the lake and fishing trawlers have been left stranded in what are now sandy wastelands. Mibazaar has put together this Google Maps mashup to take you on a tour of some of the stranded trawlers that once fished these waters. So as the Aral Sea was shrinking it left behind trawlers which had no where to go and were stranded. Some of these stranded trawlers can be clearly seen in Google Maps. Virender Ajmani, the author of the mashp has counted 10 but it's obvious there are many many more. If you find more, please do let him know and he will add it to this map. 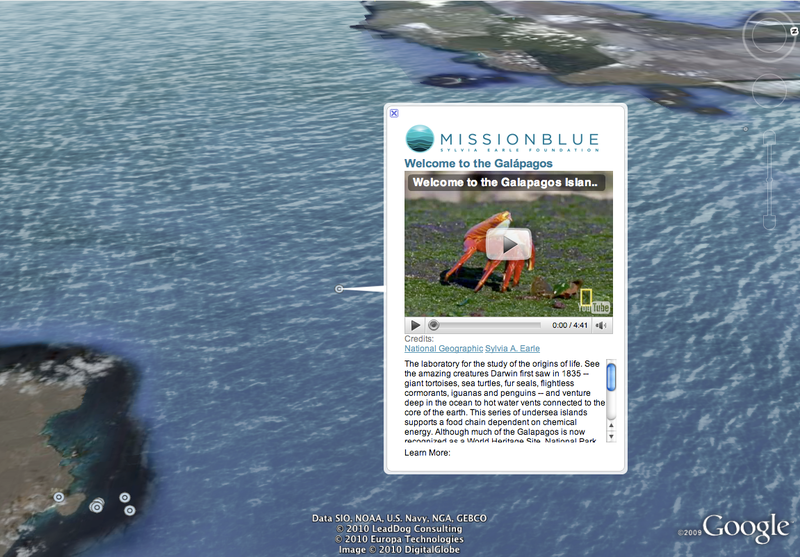 At the beginning of April, Google announced a new default layer for oceans in Google Earth. The new oceans layer includes hundreds of sites generated from data, images, and videos from organizations like National Geographic, NOAA, and dozens of others. In the same announcement, Google featured a new narrated tour called Hope Spots in the Ocean Showcase which displays eight places around the world considered to be indicative of the health of the world's oceans and marine life. As hundreds of thousands of air passengers disrupted by the consequences of the Icelandic volcano ashes, two of the three creators of the Marine GeoGarage are stranded abroad : Loïc in Barcelona (Spain) and I in Dakar (Senegal) travelling for business. This is a new example showing we need to take into account how fragile the human race really is to vagaries of nature. The German Earth observation satellite TerraSAR-X flew over this small and remote volcanic island, acquiring snapshots that show that man-made structures can be seen easily even from space. This image shows the principle town of Hanga Roa, on the northwestern coast (in yellow), and the airport, in the western part of the island (black line). The island is has an area of just 160 square kilometres and owes its name to the Christian festival of Easter. The Dutchman Jakob Roggeveen landed on its shore on Easter Sunday, 5 April 1722, and chose the rather unimaginative name. Located about 3600 kilometres from the mainland of Chile and more then 4000 kilometres from Tahiti, Easter Island can justifiably be described as the most isolated island in the world. The nearest neighbours – about 50 descendants of the mutineers on the British naval vessel HMS Bounty – live 2000 kilometres away on the small island of Pitcairn. James Cook, who stopped at Easter Island in 1774 during his second expedition to the South Seas, was less than delighted with the island. He wrote in his journal: "No Nation will ever contend for the honour of the discovery of Easter Island as there is hardly an island in this sea offering less refreshments, and conveniences for Shipping than it does." This is no surprise: the island was formed when lava flows from three volcanoes joined to form a landmass between them.